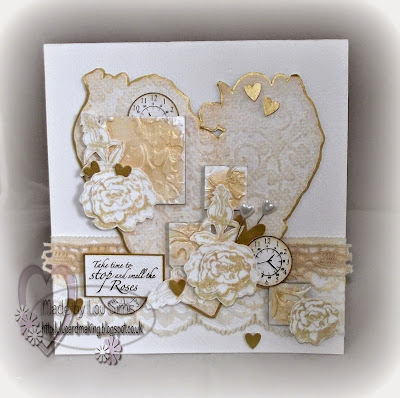 I created the heart background by using "Heart of Flower" stencil (from Premium Craft brands) with gesso. 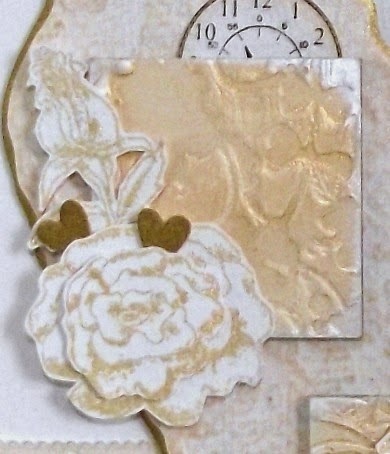 Although I wanted the parts of the stencil to show through, I also wanted a distressed look too. Once dry, I cut the heart shape out and mounted it on to gold card, cutting this out again to give a thin border. Next was the stampbords turn. 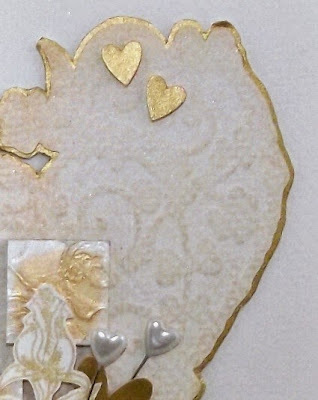 I placed several pieces of stampbord on to my gesso heart and using the same stencil, I placed it over the stampbord pieces ensuring that it lined up with the heart below. Again using gesso, I add detail to my stampbord pieces. Once dry, I covered them with soft gold metallic pan pastel. Next I stamped the gorgeous roses (Premium Craft Brands roses stamp set) with perfect medium and embossed them with gold embossing powder. 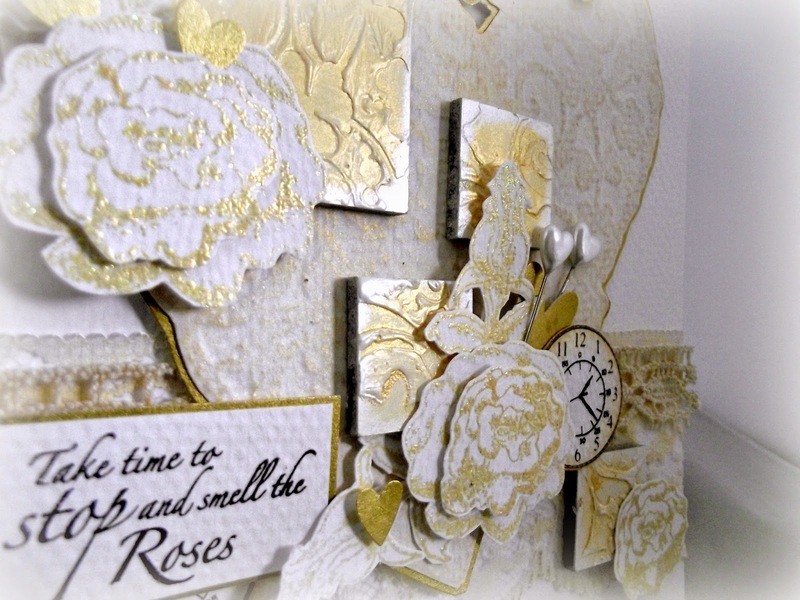 I cut all the images out and for added lustre, covered them in white pearlescent pan pastel. 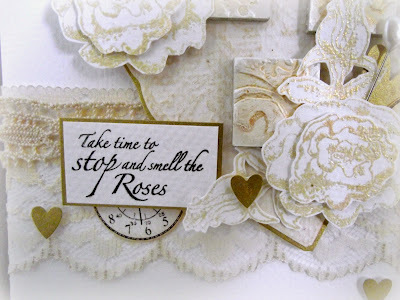 I also stamped out clock images and the wonderful sentiment from the same stamp set in black archival ink. Finally, assembling all my "bits" to create my finished card. 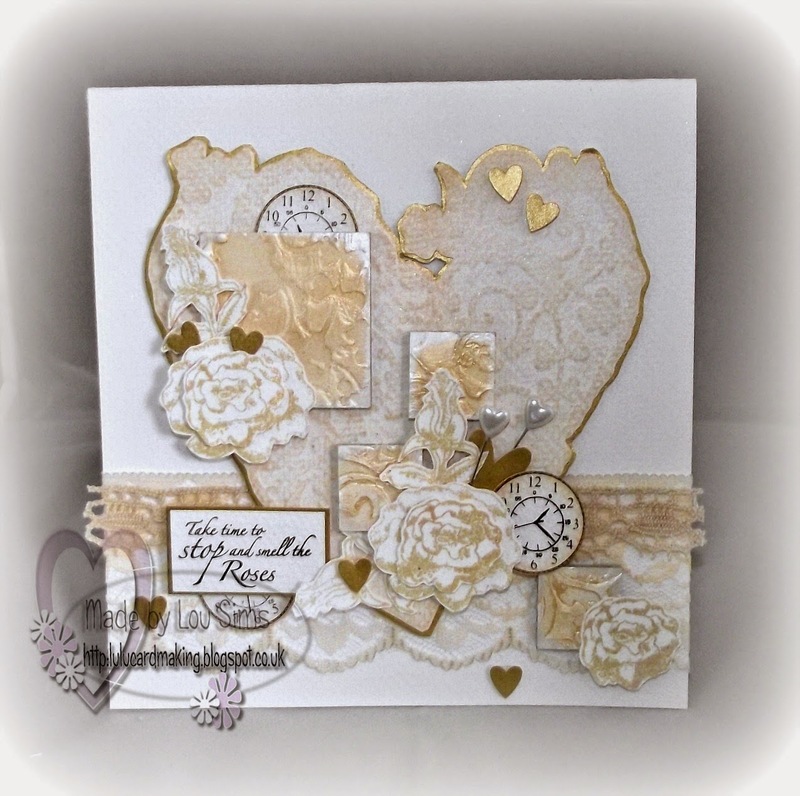 I wanted to keep the embellishments to a minimum in order that all the other elements took pride of place, so only added lace and small punched, gold hearts. I have had a blast playing and creating with stampbord but now need to get my stampbord tools out . . . . . watch this space . . . I love the heart! A great way to use that stencil and the stampbord pieces picking up the pattern is ingenious! 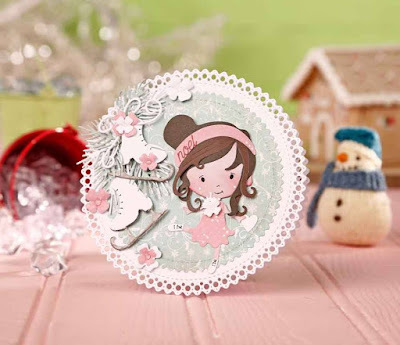 Fabulous, love the complete elegant appearance of this card! 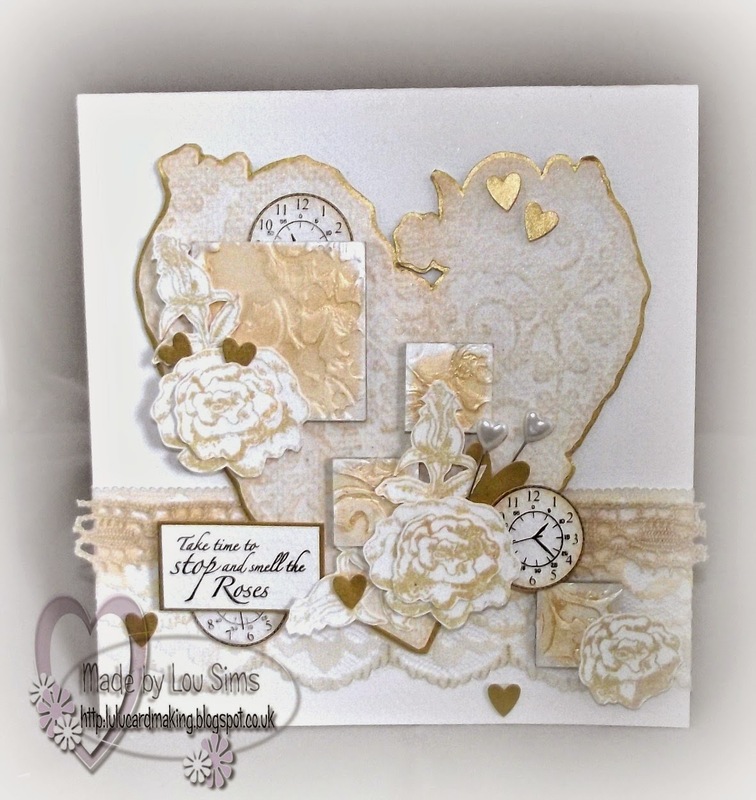 Beautiful gold embossing, love your card! Wow! Very pretty! Love the white and gold together! Thanks for joining us at Just Us Girls! Loe the rich gold and white of your collage card! 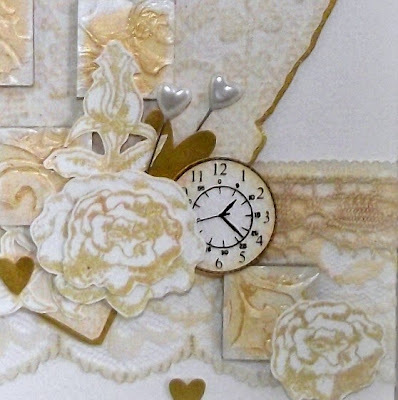 Fabulous design work!mthank you for sharing with us at Inkspirational!